Parque Botanico Resort & Country Club Is a wonderful enclave of peace and tranquillity set in the hills amidst lush greenery and running waters, and yet it is only 5 minutes drive to the nearest sandy beaches and 10 minutes from the busy towns of San Pedro and the Port town of Estepona, Puerto Banus and Marbella. The property is surrounded by natural footpaths, various outdoor pools and has an on-site full spa and indoor heated pool facility, two all weather tennis courts, two squash courts and many other pastimes that can be enjoyed. Nothing has been spared on the interiors. A beautiful lounge and dining area, 37' flat screen TV, surround system, with patio doors leading out to the terrace. A fully fitted kitchen with all appliances and equipped with everything you require during your stay. Marble floors throughout, air conditioning for the summer and heating for cooler months. The bedrooms are equally as appealing with beautiful en suite bathrooms. Parque Botánico has beautiful outdoor pools with safe children’s paddling areas, as well as an indoor Olympic size heated pool. The indoor pool also makes Parque Botánico a perfect destination if you are travelling during the cooler months. The spa offers the ideal setting in which to relax and unwind during your stay. featuring ; Sauna, steam room and a large Jacuzzi overlooking the out-door pool area. Parque Botánico offers a fully equipped gym, 2 squash courts and two all weather tennis courts. The mountains surrounding Parque Botánico offers great hiking possibilities. There are options for anyone, from those just looking for a fifteen-minute stroll in the sun to the more adventurous interested in day trips and steep hills. Lounge/diner, marble floor, feature, fire place, Led TV, surround system with DVD, leather sitting area, dinning area sits 4, hot / cold air-condition. 1. Spacious bedroom with en-suite bathroom, double bed, LCD TV, sound system, fitted wardrobes white marble flooring, hot / cold air-condition, direct access to the balcony. 2. Specious bedroom with twin beds, fitted wardrobes, bathroom, white marble flooring, hot / cold air-condition, direct access to the balcony. Modern fitted kitchen, kitchen with direct access to the balcony, espresso machine, ceramic cooking top, oven, microwave, toaster, dishwasher, washing machine, dryer. The specious terrace is accessible from all rooms and kitchen; enjoy the view over palm trees, plants, flowers and the properties lake. Surroundings:: The privileged situation of Parque Botánico Resort & Country Club between the Sierra Blanca behind Estepona and the Ronda mountain range, and only a few kilometres from Marbella and Estepona, municipalities bordering with the territory, convert Parque Botánico into an authentic treasure for lovers of unspoilt nature. The Benahavis territory is very picturesque. From the N340, between San Pedro and Estepona, you'll get to the Benahavis access road. Immediately, the terrain gets more mountainous, and the first outskirts of the Serrania de Ronda show up. Over the ages, the Guadalmina river has carved out a deep valley on the side of the road. On both sides, you can see the mountain peaks. Close to the village, the river valley becomes a real canyon, which is called ' las Angosturas ' because of its narrowness ( all to do with 'anguish' ) , which is classified as a natural monument. This was a great apartment in a lovely complex. The pool is fun and the patio outside was nice for dinner al fresco. Kitchen was well equipped and there’s High-speed internet and AC. Is a wonderful enclave of peace and tranquillity set in the hills amidst lush greenery and running waters, and yet it is only 5 minutes drive to the nearest sandy beaches and 10 minutes from the busy towns of San Pedro and the Port town of Estepona, Puerto Banus and Marbella. The property is surrounded by natural footpaths, various outdoor pools and has an on-site full spa and indoor heated pool facility, two all weather tennis courts, two squash courts and many other pastimes that can be enjoyed. nothing has been spared on the interiors. A beautiful lounge and dining area, 37' flat screen TV, surround system, with patio doors leading out to the terrace. A fully fitted kitchen with all appliances and equipped with everything you require during your stay. Marble floors throughout, air conditioning for the summer and heating for cooler months. The bedrooms are equally as appealing with beautiful en suite bathrooms. • Prices may be subject to change. • • Xmas week & Easter are deemed as high season. • Sorry no animals. • • Strictly no smoking • Welcome packs are available on arrival, with basic essentials (small local charge). • Deposits: Non-refundable reservation deposit 35% of rental fee, balance due eight weeks before commencement. Deposits are none refundable unless named visitors have a medical emergency. Certified proof must be provided. 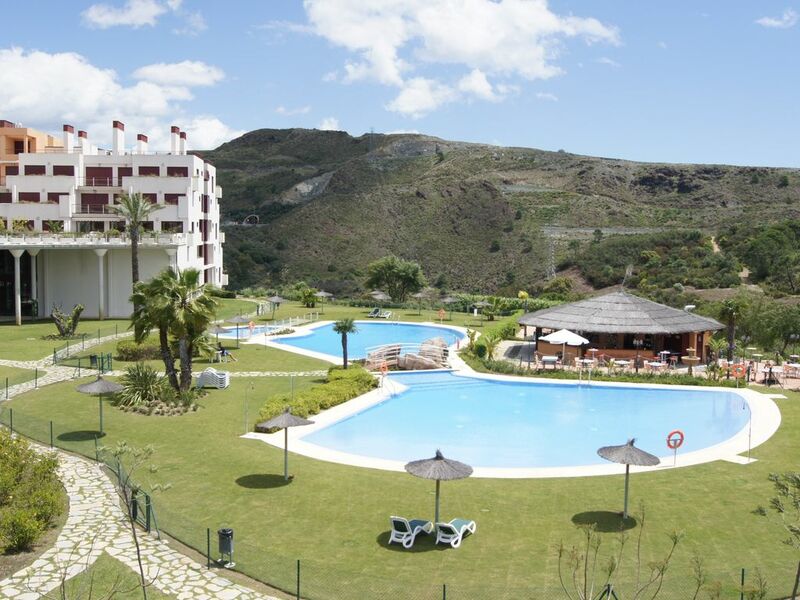 Refundable breakages deposit of 300.00 euro’s required, to be paid cash to the agent on arrival. Deposit will be refunded on departure (subject to satisfactory property inspection).? • Meet & Greet: We are pleased to be able to provide a Meet & Greet Service, where you will be met by our bilingual local agent and shown around the apartment, have any questions answered and helped to settle in. Importantly, in the event of an emergency e.g. lost keys you will have a point of contact. • Cleaning: The apartment is cleaned prior to your arrival with fresh bed linen and towels. A Cleaning Charge applies, which includes final clean/laundry/linen/towels, [payable direct to our agent] Cleaning and other services are available through our agent and a list of these services will be sent to you on confirmation of your booking.